Card Text Play: Each player with 6 or more is reduced to 5 . 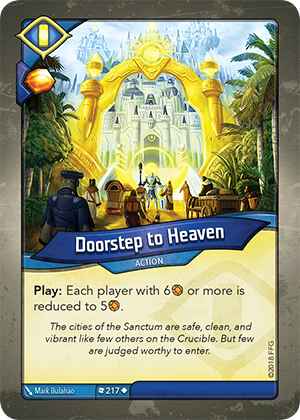 Flavor text The cities of the Sanctum are safe, clean, and vibrant like few others on the Crucible. But few are judged worthy to enter. When I play Doorstep to Heaven, do I gain the Æmber bonus before or after the “Play:” ability? Before. Gaining an Æmber bonus is always the first thing that happens when playing a card, so it happens before resolving the “Play:” ability. This means that if you have 5 Æmber before playing Doorstep to Heaven, you will have 6 Æmber when the “Play:” ability triggers, thus being reduced back down to 5 Æmber.